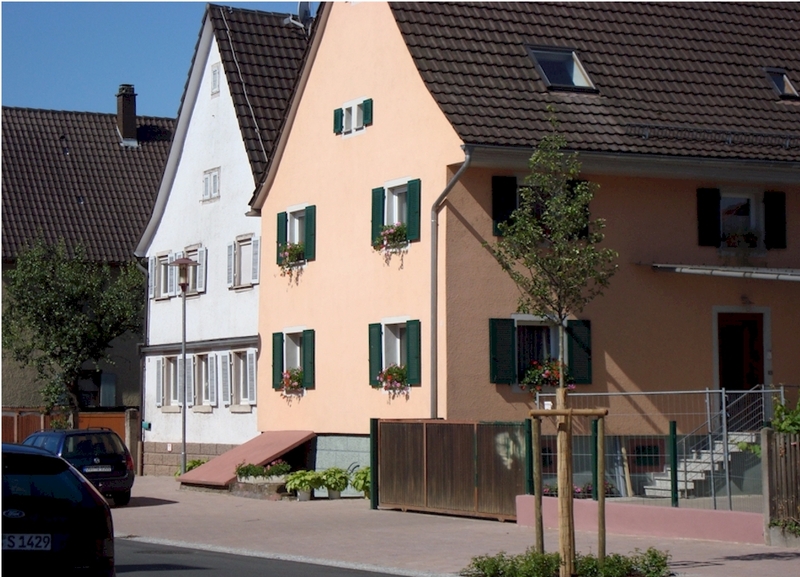 Wolfram was born in the village of Ringsheim, near the banks of the Rhine, which is also the French border. Ringsheim is on a major rail line between Strasbourg in the north, and Freiburg in the south. Four miles away is the village of Rust, something like Disneyland but far superior. This has brought great prosperity to the area and totally changed it from the sleepy, rustic place it was when Wolfram was born. Events in Wolfram's life are somewhat hazy, due to the fact that he created an alternative reality which he believed in as much as anyone else. So what I tell you here may not be accurate, but it is the picture as I have come to understand it. Wolfram's Mum Maria Weber was a village girl, and his Dad was a housebuilder from further north. 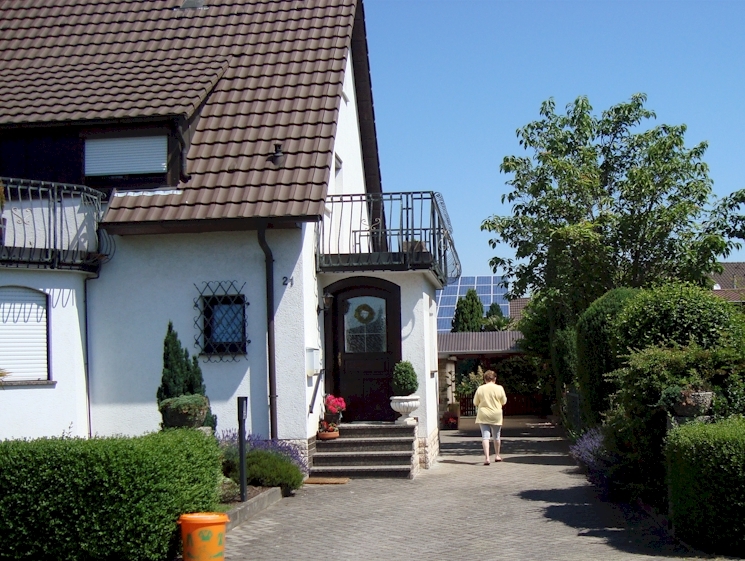 Maria was very traditional, and when she married Bruno Thome they shared the family house with Herr and Frau Weber, who expected their daughter to be on hand to help them. The house was divided into two, and the Thomes lived upstairs, though when the second child came Wolfram was given a tiny little bedroom at the back of his grandfather's study. Grandfather first worked in the iron ore mines and when he retired he ran an insurance business. Grandma worked in the local factory, where her daughter Maria joined her, and Bruno was a self-employed builder. Thus, everyone was out at work, and the little Wolfram and his even younger sister were put in the kindergarten. It was there that the little Melita, aged two, met with a tragic accident when she was scalded by running into a nurse carrying a huge bowl of boiling water. Wolfram, aged four, witnessed this. He told me, "I got on my little tricycle and pedalled as fast as I could through the village to the factory where Mam and Oma were, and I told them to come quick." But the little girl was hospitalized and lived only a few days, being unable to survive the burns. Wolfram said his mother was not allowed to see her, which must have been terrible, both for her and her daughter, dying without the comfort of her mother's love. This was the first tragedy to strike the Thome family. The second came when Wolfram was eight and went into proper school. Being a naughty boy, he sat at the back, but every time the teacher wrote something on the board he had to go stand in front of it before he could read what was there. His parents were sent for, his eyes tested and he was sent far away from home to Blind School. He always called it this, but he told me all kinds of children with handicaps were sent there. It was a school of hard knocks, by all accounts, German children were not encouraged to think of themselves as disabled in any way, they just had to get on with it. It was a lonely life for a little boy, so far away from home. His mother told me they could not go to see him as often as they would like, as the distances were so great, and she told me how she remembers 'his little face, pressed up against the gate when we left, and him saying - "Don't leave me, Mam, don't leave me here." He had a hard time at school on account of his Black Forest accent, which was like being Irish here - people from certain regions are labelled 'stupid' or 'backward' and are mocked. This served to toughen him up, and taught him that everyone is valuable, no matter what their origins. He would never allow me to use words such as 'stupid' or 'idiot'. He pulled me up short if I did, insisting on respect for everyone. So poor Maria Thome had lost both her children, and it was not long before her husband followed, dying of a heart attack at the early age of 39, when Wolfram was fifteen. Wolfram says of that day that he was very surprised when his father invited him to sit with him after Sunday lunch and share a beer and a cigar, saying he was now grown up enough. He also gave him a generous sum of money. Wolfram said his father had never spoken kindly to him until that day. Bruno then went out to play a game with the village men and dropped dead on the pitch. Wolfram thinks he must have known in some way he was about to die. He can account for it no other way. His school years, according to Wolfram, were full of adventure. He claimed to have saved his pocket money and paid for training in martial arts, in order to overcome the school bullies. I have no idea if this is true, but he did know and practice martial arts. He told me he used to climb out of the dormitory window and go out into the town at night, and that he had an affair with the daughter of one of the masters. He was an attractive lad, with a mop of wiry blond curls and a cheeky grin, so it may be true enough, and Germans had a tradition of locking children into their rooms at night, and then turning a blind eye to them escaping through the window. He also claims to have led a riot when transferred to another school where the food was not up to the same standard as the one he left. I rather like this story, as it shows an appreciation of food, which he certainly had. He also ran away from another school he did not like, getting onto a train behind an English couple and pretending to be with them when the ticket collector came - apparently children travelled free - taking advantage of the fact they did not speak German. Now the stories diverge. In the 'invented' version Wolfram goes to University to study massage, but is involved in a road accident while coming home one snowy night with two friends. They are walking in the road, when a car hits them and Wolfram wakes up lying in the road and cannot move his right leg. When he can manage to sit up and feel himself to assess the damage, he discovers his foot almost severed, lying at right angles to where it should be. He is healed but as a result has one leg shorter than the other. This part of the story is true. Doctors tell him that later in life he will suffer back pain, and as this would adversely affect his career as a masseur, he has to leave the course. The Mama told me that Wolfram left school and came to work with her in the BASF factory, making cassette tapes. Wolfram also claimed to have worked for Sudwestrundfunk as a dj, and also with Canadian radio stations. The street where he lived was part of a development built for Canadian forces during WW2, and he had Canadian friends. With his interest in music, it is likely he hung around the Canadian radio station and had lots of friends there - when he first came to England, he spoke with a Canadian accent (source: Wolfram, needs verifying). However it is unlikely he had a career as a radio dj.